Surface area of the surface(s) to be painted. Spreading rate of the paint being used. The number of coats needed. To paint the living room walls - not including the ceiling. The walls are 3m high, with a total of 18m of wall length (allowing for doors and windows) the surface area is 3m x 18m = 54m2. The walls are currently painted and are in good condition. Resene Zylone Sheen - low sheen acrylic is selected and has a theoretical spreading rate of 11 square metres per litre. Because the walls are previously painted and in good condition, only two coats of Zylone Sheen will be required. If you know the 'Surface area' enter it in the 'Surface area' box below, then 'Spreading rate' and 'Number of coats', then click the 'Calculate' button. 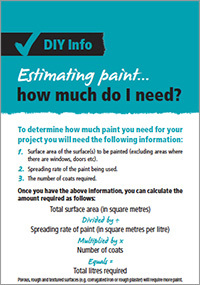 To calculate the surface area enter 'Height/length' and 'Width' of area to be painted, click 'Calculate Surface Area' and enter spreading rate and number of coats, click 'Calculate'. (ie corrugated iron) will require more paint. Enter the square area (m2) of house plan below and press "Calculate"
This quick estimate works as a general guide for most houses, but extreme designs or colour palettes tailored to each room will need a more careful approach with each room calculated individually.